Ractopamine, a β-agonist used as growth promoter in livestock, is with great controversy, and it has been forbidden in most countries worldwide. However, due to economic benefits, the possibility of widespread abuse of ractopamine still exists. “Omics” strategies, based on the observation of physiological perturbations, are promising approaches to tackle drug misuse in breeding animals. A study was performed to determine if serum-metabolomics could be used to establish a predictive tool for identifying ractopamine misuse in pigs. Our aim was to set up a high performance liquid chromatography—high resolution mass spectrometry based metabolomics workflow for screening pig serum for ractopamine administration. Therefore, an untargeted metabolomics approach was developed to characterize and compare serum metabolic profiles from control and treated pigs. Two different extraction strategies were investigated, and the results showed that the combination of methanol extraction and methanol–water extraction protocols significantly improve the metabolites coverage. A two-level data analysis using univariate and multivariate statistical analyses was carried out to establish descriptive and predictive models. The discrimination of treated animals from control animals could be achieved. A number of candidate biomarkers that contributed the most in the observed discrimination could be listed. This research indicates that metabolomics approach can be considered as a powerful strategy to highlight biomarkers related to ractopamine treatment in pig which may subsequently be implemented as screening strategy to predict for such illicit practices. Study identifier in Metabolights: MTBLS384. The online version of this article (doi: 10.1007/s11306-017-1212-0) contains supplementary material, which is available to authorized users. The animal study was approved by the national Ethical Committee (n°6) under agreement 2,015,092,516,084,715 / APAFIS 1914 (CRIP-2015-054). We confirm that this manuscript has not been published elsewhere and is not under consideration in another journal. 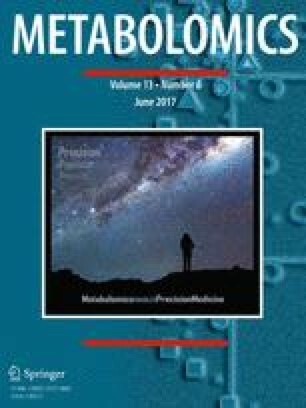 All authors have approved the version of this manuscript and agree with its submission to Metabolomics. Bottemiller H. (2012). Dispute over drug in feed limiting US meat exports. Retrieved from Sept 15, 2016 from https://thefern.org/2012/01/dispute-over-drug-in-feed-limiting-u-s-meat-exports/. Bottemiller H. (2013). Escalating trade dispute, Russia bans Turkey over ractopamine residues. Retrieved Sept 15, 2016 from http://www.foodsafetynews.com/2013/02/escalating-trade-dispute-russia-bans-turkey-over-ractopamine-residues/#.V7cJ_fmep8o.